Those of us who use insulin pumps are very used to dealing with cannulas. 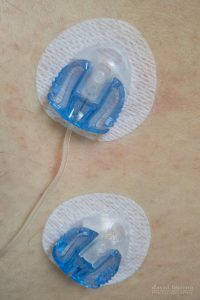 The pump is connected by tubing to a cannula inserted into the skin. We have to replace this cannula with a fresh one every 2-3 days (both to avoid infections and to stop insulin absorption slowing down). Everyone using a pump is very used to this, and the regular “changing of the line” is routine. We’re taught when we get our pump “fitted” (officially it’s a prosthesis which is fitted during a hospital stay) how to manage refilling the pump’s reservoir and changing the cannula. But over time we learn a few tricks. Here’s one I picked up somewhere in the last 8 years of pumping. Occasionally an infusion site is “bad”. Sometimes it’s because the cannula has malfunctioned (e.g. the teflon cannula tube might get kinked), sometimes it’s because scar tissue in that area is interfering with the insulin absorption. Sometimes leakage around the cannula becomes obvious, but often the only sign of a problem is that your blood sugar level keeps rising no matter how much you bolus. I had one weird case where there seemed to be a 2-hour delay: at first it seemed like nothing was happening, and then the boluses started to have effect (which after sending my sugars high, threatened to send me low, and the 2-hour delay seemed constant). So if the cannula isn’t working, we break out a new one and do the change again. Some people keep an insulin pen on hand and give themself an injected bolus to bring their levels down (this can also be a useful test that it’s the cannula that’s causing the high and not some other mystery). I don’t do that: it would be yet another thing to carry, and I would only need it in that sort of failure mode. But it’s a bit of leap to immediately assume the cannula is malfunctioning just because your sugars were going up. Sometimes it’s a problem with the insulin, or an issue with your metabolism (did you mis-count the carbs that were in dessert?). So you wait and test, and eventually have to decide to try a new cannula. When I insert a new cannula I leave the old one in place for a little while (assuming it had been working OK up until the change). Here you can see a new cannula (and tubing) I’ve just inserted, near the previous cannula which I’ve covered with the supplied clip. Incidentally that clip doesn’t seal the old cannula off (it has a rubber seal for that, which you can see being pierced by the tubing’s needle in the top cannula). But it can stop the plastic hooks catching on clothing. Often I don’t bother using it. Then if the new cannula is working (I’ve seen the effects of boluses using it) I will remove the old cannula. But if I think the new cannula might be misbehaving, I can quickly unclip the tubing, re-connect to the old cannula, and give myself a bolus. If that works, I can replace the faulty cannula and switch over to it. Doing this as routine has been invaluable many times. Usually my cannulas work without fault, but when one fails it’s usually straight away, and having the backup cannula there is very convenient. Also there have been times when almost every 2nd cannula has failed, and without this routine it would be a lot more stressful. Many people are taught to never do a cannula change before going to bed in case there’s a fault overnight. If I have to I can do a cannula change in the evening, and know that if my levels go high overnight I can quickly change back to a working cannula without even getting out of bed. I’d otherwise remove the old cannula in the morning. I don’t leave the old cannula in for too long. Also in some people the cannula can become blocked if it is not used for a while, but I’ve never left it in for long enough to notice that. But keeping it in for a while has been useful on many many occasions! I should mention that there are some pumps available outside Australia (e.g. the Omnipod) which are tubeless, and the Cellnovo pump which is being introduced in Australia in October has a different (“almost tubeless”) system. But the Medtronic/Animas/Accu-Chek/Dana pumps in common use in Australia all use discrete cannulas/tubing as I’ve described. I have thought of doing this but lately, things have worked very well, change or not. Thank you for giving me some food for thought at least. Brilliant idea David… leaving the old cannula in till you know the new one is working … I’ve done this for a couple of weeks now since reading your post and today it saved me … it’s very difficult for me to do set changes at work and today when my BGs started skyrocketing due to a dodgy pump site I just switched back to the old one.